Week 7 was a lesson in the kinds of games the Washington Capitals need to play to win and the kinds of games that can ruin their season. In the first and last games they played opponents close, were opportunistic on offense, and got fine goaltending. Both ended in wins. In the middle games of the week, the Caps were done in with speed and their own sluggish starts, fell into multiple-goal deficits in the first period, got less inspired goaltending, and lost without putting up much of a fight. The best that could be said about Week 7, record-wise, is that it was the fourth straight non-losing week for the Capitals. The next best thing is that the Caps won both home games, extending their home winning streak to five games after dropping three of their first four home games this season. It might not seem like a lot, but after the franchise record 15-game home winning streak the Caps had to start the 2017 portion of last season, a four-game streak was their longest on home ice. On the disappointing side, the Caps played four teams out of the Western Conference in Week 7, three of which were out of the playoff eligibility group. Washington eked out a 2-1 Gimmick win against the Edmonton Oilers and held off a tough Minnesota Wild team playing their backup goaltender in a 3-1 win. But the Caps were run over by the Colorado Avalanche in Denver, a surprise even if the Avalanche were a far better team on home ice (6-1-1 at week’s end) than on the road (3-7-0). And when the Caps had a benchmark game, against the Nashville Predators (fourth-best record in the West at week’s end), the Caps came up short…very short, in a 6-3 loss. The Caps had a double-whammy – well, “whammy” might not be the right term here – against them on offense in Week 7. They managed only nine goals in four games, and only five of those came at even strength. On top of that, seven of the nine goals were recorded by only three players: T.J. Oshie (3), Dmitry Orlov (2), and Evgeny Kuznetsov (2). Missing on the goal register was Alex Ovechkin, who has been in a bit of a slump. He has just three goals in his last 13 games and had his current streak without a goal extended to five games by the end of Week 7. Nicklas Backstrom also had a goalless week, his streak without one reaching 14 games. Backstrom finished the week having yet to score a goal on home ice this season. The Caps did get points from 12 skaters in Week 7, led by Oshie (3-2-5). Kuznetsov had four (2-2-4), as did John Carlson (0-4-4), who led the team in assists. 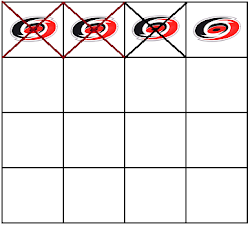 By the standards of this season, holding four opponents to a total of 120 shots (30.0 per game) was not a bad week. It brought down their season average to 32.5 shots per game (20th in the league). What might have stood out most in Week 7 was that the Caps improved on shot attempts allowed over all four games. 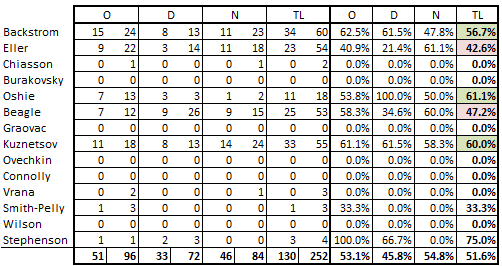 They allowed Edmonton 64 attempts, 58 for Nashville, 54 for Colorado, and 52 to the Wild. That might be something of a mirage, though. On the other hand, Nashville lit the Caps up for 18 shots (two goals) in the first period of their 6-3 win over the Caps, and Colorado had two goals on ten shots in the first period of the Caps’ 6-2 loss to the Avalanche. 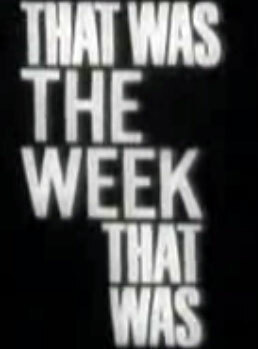 Uneven would be one way to describe the week in goaltending for the Caps. One could say that against the speed and depth of Nashville, and the speed and skill of Colorado, that Braden Holtby and Philipp Grubauer were left on a deserted island too often to make saves, but it wasn’t a good week for the netminding tandem, either. This is the same tandem that finished last season with a combined goals against average of 2.06 and a combined save percentage of .925. 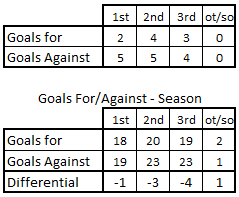 With numbers in Week 7 that were among the worst they put up this season, their combined GAA is up almost an entire goal per game than that with which they finished last season, and their combined save percentage is almost 20 points lower. It was a generally poor week for both Holtby and Grubauer.As a pair their save percentage was under .900 in each of the three regulation periods for the week. Holtby fared a bit better individually with a .914 save percentage in the first period of games and a .955 save percentage in the third periods of the two games in which he played a third period (he was pulled after 40 minutes in the loss to Nashville). Holtby had an off night against Nashville (six goals allowed on 25 shots), but he came back against Minnesota to finish the week, stopping 30 of 31 shots, giving him a 7-1-0, 2.31, .928 record over his last eight appearances. For Grubauer, the week was another in a difficult start to the season for him. He was under .900 in each of the combined three periods for the week and was .824 in save percentage overall (28 saves on 34 shots). He finished the week with a 3.86 GAA for the season (47th of 49 goalies with at least 250 minutes in ice time) and a .876 save percentage (47th) to go with an 0-5-1 record in eight appearances. The Caps were shut out on the power play to open the week, but they recorded power play goals in each of their last three games in their best week since Week 2 (33.3 percent). 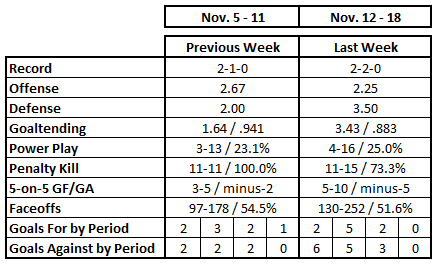 The week built on the success of Week 6 (3-for-13) to give the Caps a 24.1 percent power play (7-for-29) over the last two weeks. The scoring was divided evenly between T.J. Oshie and Evgeny Kuznetsov, who had a pair of power play goals apiece in Week 7. What they did not get was a power play goal from Alex Ovechkin, who went 0-for-7 shooting (leading the team in power play shots on goal). He has gone six straight games without a power play goal and has just one in his last 13 games. As a team, the Caps were efficient to a point, putting 24 shots on goal in 23:47 of power play ice time. They were better late in the week (18 shots in 16:11 in the two games against Colorado and Minnesota) than they were early in the week (six shots in 7:36 against Edmonton and Nashville). The penalty killing is falling into a disturbing pattern for the Caps. If they aren’t perfect (Weeks 1 and 6), they are bad (below 80 percent in the other five weeks). Week 7 qualifies in the latter category. 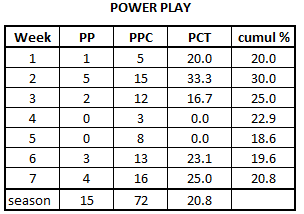 And it might have been worse but for the fact that in the opening game of the week, the Edmonton Oilers did not have a single power play (the best penalty killing being the penalty you don’t have to kill). As it was, the shots per minute were not bad (18 shots in 23:20 of shorthanded ice time), but allowing four goals on 18 shots (.778 save percentage) is an item in need of improvement. 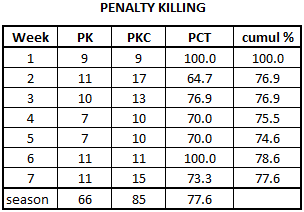 Here is a disturbing fact about the penalty killers. The 77.6 percent penalty kill is, at the moment, the worst number for the Caps since the 2004-2005 lockout. It is the worst for the Caps since the 1994-1995 lockout that shortened that season, in fact. It is the worst since the 1984-1985 season (77.1 percent; numbers form NHL.com). The Caps had a decent week in the circle, finishing over 50 percent. It was not quite as good as it looked, though, as the Caps were most dominant in the neutral zone (46-for-84/54.8 percent). They did finish over 50 percent in the offensive zone (51-for-96/53.1 percent), but they were underwater in the defensive zone 33-for-72/45.8 percent). In the “faceoff don’t matter” category, the Caps had their best game, in total (64.2 percent) and in each zone (offensive: 63.2 percent; defensive: 61.9 percent; neutral: 66.7 percent) against Colorado in a game they lost by four goals. It happened to be the only game they “won” for the week, splitting 60 draws with Minnesota and under 50 percent against Edmonton and Nashville. Individually, it was an odd week, Evgeny Kuznetsov winning 60 percent of his faceoffs and Jay Beagle with an uncharacteristic 47.2 percent wins. T.J. Oshie (11-for-18/61.1 percent) and Nicklas Backstrom (34-for-60/56.7 percent) were on the good side of 50 percent, while Lars Eller was the fifth Cap with ten or more draws, but won just 42.6 percent of those faceoffs. 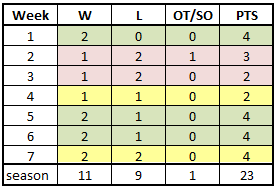 First periods killed the Caps in Week 7, the team getting out-scored by a 5-2 margin. They allowed first period goals in three of the four games, allowing two first period scores in each of the two losses. Those five goals allowed in the first period of the games of Week 7 make up more than 25 percent of the total they allowed in the opening 20 minutes this season (19). They just about held their own in the last 40 minutes, in the aggregate, but falling behind was too much of a hole to dig out of to make this a successful week. Those first period goals allowed left the Caps with a negative goal differently in all three regulation periods for the season. And at the end of it, only two teams – Edmonton (6) and Montreal (8) – have more losses by three or more goals than the Caps. Week 7 showed the Caps at their best and at their worst, at least within the confines of this season. A one-goal/Gimmick win and another win that was a one-goal game 57 minutes into the contest. They have as many or more one-goal wins (6) than all but two teams – Pittsburgh (8) and Tampa Bay (7). 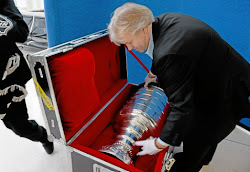 But they had two losses by three or more goals that left them with that disturbing ranking in such losses. Having hit the 20-game mark, it is becoming clear that this team, until such time that the young guys become more consistent contributors and until they are fully healthy again, is going to be successful in 2-1 and 3-2 games. In 5-2 games and 6-3 games, chances are they will be on the wrong side of those scores. But now, the focus switches not to margin, but venue. The win over the Wild to end the week was the Caps’ fifth straight at home and was the first game in a stretch in which the Caps play nine of ten games on home ice. There is no more important stretch of the season so far, and perhaps none that will come later, than this ten-game stretch on which the Caps just embarked.